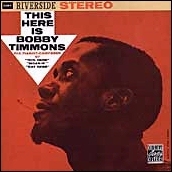 In separating the wheat from the chaff in the area of soul, there seems no room for doubt as to which side of the ledger Bobby Timmons belongs on. The young pianist, who is making his debut as a leader on this album, is already recognized by a great many listeners as being among the most soulful of all. This is true even though quite possibly many of them have not been aware that it was Timmons they were digging. For Bobby's first real tastes of jazz success have represented rather a reversal of the usual order of things: at a time when not too many have been aware of him as a player, his tunes--specifically Moanin' and This Here--have already become household words to the jazz public. Appropriately enough, this trio LP gets underway with Bobby's own version of This Here. Cannonball [Adderley]'s frequent description of this number as being "simultaneously a shout and a chant" and being related to "the roots of soul church music" is a good word-picture of its nature. It is very definitely a hand-clapping number: when it is played on the job, it is endlessly fascinating to watch and hear the crowd join in that way (even though the fact that it is also a waltz seems to escape a good many people and causes them to get fearfully tangled up in their clapping!). Moanin' is an equally rhythmically compulsive effort that first drew attention when recorded by Art Blakey's Jazz Messengers. There are two other newer Timmons tunes here as well: Dat Dere, another shouter with just a suggestion of a Latin strain to it; and the driving Joy Ride. The former leaves room for solo work by Sam Jones, currently a team-mate of Timmons' in the Adderley group (he has also worked with Dizzy Gillespie and Thelonious Monk) and unquestionably among the finest and firmest of today's bassists. Joy Ride, in turn, spotlights the other member of this trio, drummer Jimmy Cobb, who was in an earlier Cannonball group a couple of years back. He has also worked with Dizzy, and has more recently been a Miles Davis mainstay. The other selections are all standards, and they serve to demonstrate both that Bobby's soulful touch can embrace a wide variety of material and that he is capable of a good deal of lyrical tenderness--as in the relaxed ballad treatment of Funny Valentine (this version, incidentally, is know to Bobby's friends as "Funky Valentine") and in his unacompanied performance of Billy Strayhorn's aching Lush Life. Even more directly relevant is the fact that this young pianist has been developing and maturing at a rather astounding rate, and has found for himself a distinctive and validly soulful groove that marks him not only as one of the real coming stars but also as someone very much worth listening to right now.